New web camera has been installed by a white stork nest in Slītere National Park. The live broadcast can be seen here. The broadcast from the nest is made possible within a framework of The Baltic Sea Region Programme project “Baltic Green Belt”. Nature Conservancy Agency realized project “Baltic Green Belt” educational activities about nature in Slītere National Park territory. During this project they offer a chance to watch nature in live broadcast as well as filmed fragments about animal lives in the wild. Broadcast from the White Stork nest is the second live broadcast in the Internet co-financed by the project. Since last year, on the roof of the Slītere Lighthouse was installed other web camera showing vast landscape on forests and the Baltic Sea. To raise people awareness for nature conservation, since 2010 in this web page and popular site www.youtube.com we publish videos on wild animal life. 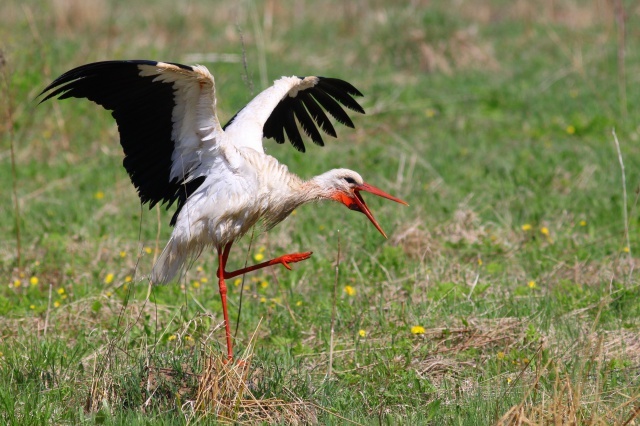 Only two White Stork families nest in Slītere National Park. This very common bird is rarely seen here as most of the Slītere National Park territory is covered with forests. White Stork is a bird that needs open landscape. However, White Stork shy cousin Black Stork can be seen more often in Slītere National Park as dense forests with natural watercourses and swamps is very suitable for this bird.